I love having a daughter and enjoy her enthusiasm for the girliest of outfits and accessories. Every morning she wakes up, picks out a dress, hair accessories, and shoes that she will wear for the day. 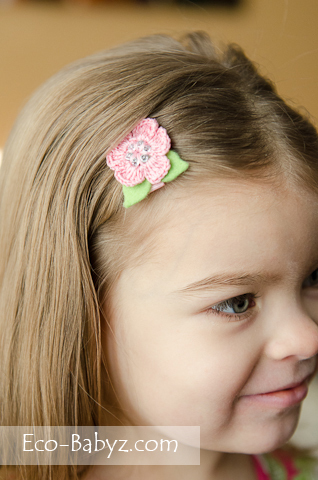 We always have a shortage of hair accessories because they get misplaced or break, and we don't have many to begin with. 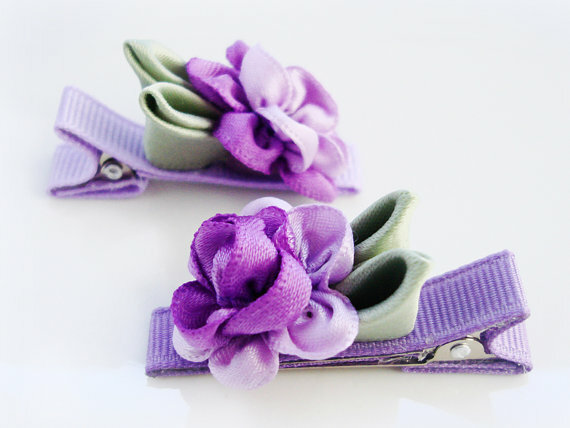 Baby E was thrilled to receive some handmade hair clips from Bloom Creations Etsy store. She tried the Brielle Turquoise Organza Ribbon Rose Hair Cllip ($4.50, above), and the Karis Small Crochet Flower Hair Snap Clips with Sparkle Center in Light Pink and Tan ($6 for a pair, below). As you can see, these are absolutely beautiful! 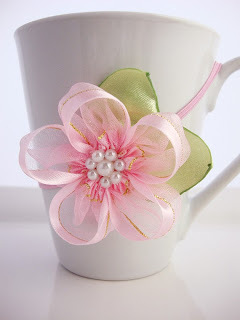 There is something about handmade hair accessories that's unique, you can't find anything like this at a store. The thing I love most about these is that they are lined with a non-slip material! You will not need to constantly put it back in the hair all day after it slips out, it stay put unless my pre-schooler is tumbling on her head. 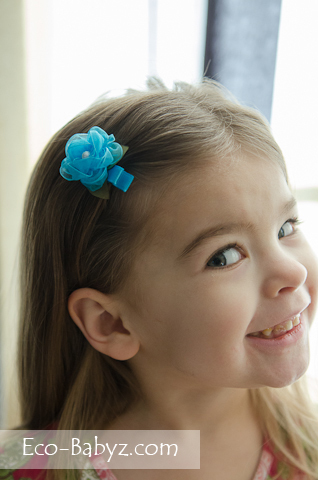 The Organza Ribbon Hair Clip in turquoise is a full size clip, perfect for toddlers and little girls. 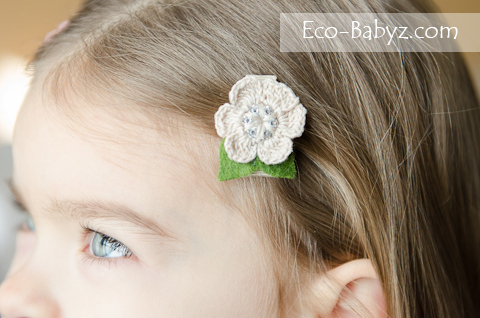 The two crochet flowers come on a snap clip, they are smaller in size and really perfect for newborn, infant, and baby girls - though as you can see, they look great on my toddler too, they just don't hold as much hair. Take advantage of their Valentine's Day Sale! Today and tomorrow only, get 20% off your purchase with code VALENTINES at checkout! Bloom Creations has generously offered to give away two hair clips or snaps of the winner's choice to one of our readers during the Handmade from the Heart event that launches tomorrow, Valentine's Day! Disclaimer: I did not receive payment for this review. I was provided a sample of the product for review purposes. The opinions are my own and genuine. These are so pretty! I especially love the crocheted ones!